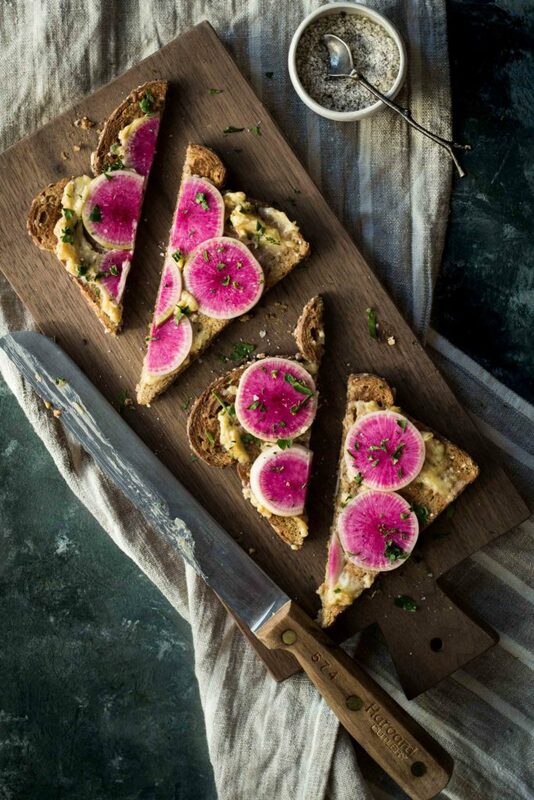 Tis the season for watermelon radishes and we could not be happier! We wait all season long for these beauties to size up (we sow them in July) and we are always ecstatic when they’re finally ready for harvest. Watermelon radishes have a nice mellow spice and a wonderful crunch, but what we love most about these radishes is how strikingly beautiful they are. I mean look at that color?!?! You can typically find watermelon radishes at your local farmers market or well stocked grocery store this time of the year. However, if you cannot find them you can simply substitute with traditional radishes or even salad turnips. Our favorite way to serve watermelon radishes is to simply slice them thin and sprinkle them with sea salt for a simple snack. However, they taste great pickled, shredded into slaw, or in this case, served on toast with miso and butter. The miso-honey butter that I made here is extremely versatile and tastes great dolloped onto steaks, roasted sweet potatoes, baked chicken (make sure to get a little butter under the skin before it cooks for extra flavor!) or pretty much any roasted vegetable. This recipe is actually on the blog homepage under the “let’s get saucy” category. I’ve actually made this butter so many times that I decided it needed its own page! Also, the butter makes a lot but it stores well for a few weeks in the fridge and is great to have on hand for all of your toast making, veggie roasting, or meat grilling needs! We hope you all enjoy this simple toast as much as we do. It makes a great quick lunch when served with a side salad for a complete meal. Prepare the miso honey butter according to directions here. Place your bread in a toaster oven and toast until dark brown. Remove from the oven and slather with a healthy portion of the miso-honey butter and top with minced parsley and flakey sea salt.